VroomVroomVroom has carefully handpicked the best campervan rentals in Derbyshire with some of the UK's leading RV suppliers. Whether you are planning on a ghost hunting expedition, or a relaxing weekend with your loved ones, a motorhome is a great way to get around. To find a cheap camper hire, simply use the search box above to start comparing deals. Derbyshire is a diverse mix of cities and towns scattered across the beautiful countryside. The famous Peak District National Park lies partly in Derbyshire, offering plenty of great walking trails. The city of Derby lies to the south of Derbyshire, and is a lovely city with incredible heritage. The city prospered due to its silk production, Crown Derby's fine bone china tableware and Rolls Royce engine production. It has since come to be known as one of the most haunted cities in the UK, earning itself the nickname "The Dead Centre of England". Depots to collect campervans are constantly changing. If you cannot find the location you require in the search box, please find the closest location available by scrolling in the drop down menu here. Callow Top Holiday Park is the perfect base for exploring Derbyshire and the Peak District National Park. The award-winning family holiday park is surrounded by lush greens and open spaces where you can park your camper van rental or put up your tents. If you prefer a more comfortable accommodation, you can stay in their traditional oak-beamed holiday cottage. Callow Top has easy access to Ashbourne, Buxton, Matlock, and Bakewell where you can find numerous attractions. Hop on your campervan and take time to visit the Alton Towers in Staffordshire since it is only 20 minutes away from Callow Top. Lime Tree Holiday Park is nestled on the town of Buxton and surrounded by the Derbyshire hills. The site can be found on a Special Landscaped area and situated beside a limestone gorge and amidst the spectacular old railway viaduct. The holiday park offers camping and touring caravan pitches for those travelling in their cheap campervan hire. There are also many choices in accommodation, including lodges, apartments, and static caravans. This relaxing haven has a rural setting so expect a peaceful environment. 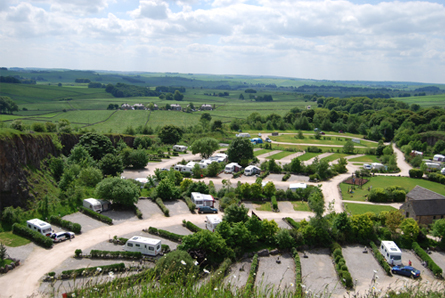 Rivendale Caravan Park is situated within the Derbyshire Dales part of The White Peak and surrounded by spectacular cliffs, gorges, and caves. If you're coming from Ashbourne and heading to Buxton, the camping site can be found on the right side of the A515. The caravan park offers hard-standing or grass pitches with 16 amp electric hook-ups for tourers and campers. The pitches can be found in the main pitching area and close to on site facilities, including the under-floor heater shower building, children's play area, and launderette. Make sure to bring a torch because the area has minimal lighting. Beechwood Park originally served as a caravan park during the early years, but now it has transformed into a fully-fledged Leisure Park. The 25-acre park lies on the edge of the Peak District and nestled between Derby and Nottingham. Beechwood Park offers pitches with electric hook-ups and basic amenities such as shower blocks, toilets, and laundry facilities for the modern caravanners. The leisure complex is just across The Elvaston Castle and near many popular attractions, including the Alton Towers, Donington Race Track, Chatsworth House, and the National Watersports Centre. The Peak District National Park is the best place to relax and have fun because of its breathtaking landscapes and exciting attractions. This place is home to numerous villages, market towns, historic houses, and traditional events. Britain's first national park is close to the hearts of many locals thus making it a popular weekend escape for families. Unlimited fun awaits park lovers of all ages – from Go Ape's thrilling high wire adventure course to the magnificent Stalactites and Stalagmites at Poole's Cavern. Chatsworth House can be found right in the heart of the famous Peak District. The historic house was once the official residence of the Duke and Duchess of Devonshire. There are more than 30 rooms waiting to be explored and they feature one of Europe's most significant art collections. Apart from the fascinating house, the Chatsworth grounds also feature a 105-acre garden, farmyard, and a great selection of restaurants and shops. Donington Park is England's first permanent motorcycle race park circuit. Its first race was held on Whit Monday of 1931 on Donington Hall Estate's narrow lanes. The racetrack was later on widened and became the home of the Grand Prix car racing. Because of the course's twists and turns, it became a popular venue for the British Superbike Championships and the Moto GP motorcycling championships. The Donington Park is more than a race track, it has become a British heritage because of its rich history. Gullivers Kingdom in Matlock Bath is the favourite destination of families travelling with kids because the theme park caters to children ages 2 to 13. Its stunning hillside location gives the thrill-seekers an amazing view whilst riding the Drop Tower, log flume, or the chair lift at the Bourbon Street. The theme park has more than 60 rides, attractions, and shows to choose from so you are assured of non-stop fun all day and night. Parking is free and you can bring your own picnic to cut down on costs. If you are new to driving in the UK, read more about the local driving rules and regulations.